If you've been to a bar or liquor store in the last decade or two, you've probably noticed some changes in the beer selection. Craft beer has been on the rise as thousands of brewers opened for business in the past few decades. As fans of the small-batch brews like to tell it: In the dark ages (the 1980s), there was only Bud and Bud Light and maybe Michelob, if you were lucky. But a boom in small-scale (a.k.a. craft) brewers saved the taste buds of drinkers across the nation by promoting styles such as India pale ales, sours, and porters, which have since become commonplace in bars and liquor stores. Today, the craft beer industry has gone mainstream, and many popular brands have been bought out by large brewers like Constellation Brands (NYSE:STZ) or joined the Craft Brew Alliance (NASDAQ:BREW), a consortium of craft brewers. Sam Adams parent Boston Beer (NYSE:SAM) is a rare stock that makes the bulk of its sales from craft beer, and is one of the pioneers in the industry, but it is seen as too mainstream by some consumers. In this in-depth look at the craft beer market, we'll explore what makes a craft beer, where the industry stands today, and examine what individual stocks in the craft beer industry have to offer investors. The definition of craft beer is much simpler than it sounds. It's not determined by a particular style, flavor, or set of ingredients. Whether or not a beer can be called "craft" largely depends on the size of the brewer and who owns it. The Brewers Association, a trade group representing over 7,200 independent brewers, defines craft brewers as small, independent, and traditional. Annual production of beer must be 6 million barrels or less, the equivalent of about 1.5 billion pints, according to the Brewers Association, and beer must represent a majority of a craft brewer's alcohol production -- flavored malt beverages, like hard iced tea or lemonade, don't count. To be considered craft, a brewery also cannot give up more than a 25% ownership or controlling stake to an alcoholic beverage company that isn't a craft brewer. Macrobrews, by contrast, produce a much higher volume than 6 million barrels. In 2016, there were 33.8 million barrels of Bud Light sold in the U.S. alone, making it the top-selling beer in the country. Because of the way craft beer is defined, craft brands that are bought by larger brewers like AB InBev (NYSE:BUD) or Molson Coors Brewing (NYSE:TAP) are no longer defined as craft beer even though they may be thought of that way by the drinking public. In 1978, there were just 89 breweries in the United States, but President Carter's deregulation of the beer industry a year later created opportunities for new companies. The number of brewers began climbing in the late '80s -- around the time Boston Beer opened its doors -- and by 1990, there were 284 brewers in the country. The industry grew rapidly over the next decade, though, bringing the total to 1,564 domestic breweries in 1999. Growth then slowed in part due to the tech bubble bursting, but it took off rapidly beginning in 2010 marking craft beer's transition to the mainstream. As of last year, there were 6,372 breweries in the U.S. The chart below shows the category's growth since 2012. As you can see, the number of breweries have nearly tripled since then. The Brewers Association classifies craft brewers in four different categories: regional brewery, microbrewery, brewpub, and contract brewery. The largest are regional breweries, which have a majority of its volume in "traditional" or "innovative" beers with an annual production of 15,000 to 6 million barrels. Some examples of regional brewers include Boston Beer, Sierra Nevada, New Belgium, and D.G. Yuengling & Sons. Microbreweries have an annual production of less than 15,000 barrels a year and sell at least 75% of its beer off-site, and they have been the fastest-growing category in craft beer in recent years. Some popular microbreweries include Hardywood, Westbrook, and Port City. The third-largest segment is brewpub, which is a restaurant-brewery that sells 25% or more of its beer on-site. As of 2017, there were 2,252 brewpubs across the country. The smallest category is contract brewery, which are business that hire another brewery produce their beer while handling the marketing, sales, and distribution aspects themselves. This segment also includes breweries that hire a separate brewery to make additional beer. The chart below shows the growth in the different categories of craft breweries over the year. According to the Brewers Association, craft beer sales grew 5% last year, compared to a 1% drop in overall beer sales, and craft now makes up 12.7% of the market by volume. However, in terms of dollar sales, craft beer is nearly 25% of the market, making up $26 billion of $111.4 billion domestic beer sales, as the small brands command a higher price point at bars and liquor stores. Craft beer may have passed its peak as the market appears to be maturing and growth has slowed from the double-digit pace seen earlier in the decade. Bart Watson, chief economist at Brewers Association, said, "Growth for the craft brewing industry is adapting to the new realities of a mature market landscape. Beer lovers are trending toward supporting their local small and independent community craft breweries. At the same time, as distribution channels experience increased competition and challenges, craft brewer performance was more mixed than in recent years, with those relying on the broadest distribution facing the most pressure." In other words, consumers seem to be increasingly preferring small and local brands, a dynamic that larger craft brewers like Boston Beer have struggled with as national brands may be seen as less authentic or interesting. The chart below shows how growth in craft beer production has slowed in recent years. Notice that regional craft beer production, by far the biggest category, has slowed as brands like Sam Adams and Sierra Nevada have fallen out of favor. Microbreweries continue to grow, however. As you can see, production slowed in 2015 as larger regional brewers got acquired and consumer tastes moved to smaller microbrews, which have continued to grow at a strong pace. Some established craft brew brands like Sam Adams and Sierra Nevada have seen sales decline in recent years as consumers have moved to more niche microbrew brands. These days, brands like Sam Adams and Sierra Nevada are often perceived as macrobrews on par with Budweiser, or other of the nation's largest brands. Volume sales of Sam Adams' flagship Boston Lager fell 12%, and Sierra Nevada saw its pale ale sales drop 9% last year, according to data firm IRI Worldwide. The biggest trend in the industry may be the number of craft brewers that have been bought out by larger alcohol companies. Among the brands that AB InBev owns are Goose Island, Blue Point, Breckenridge, and Wicked Weed. The Budweiser parent even took a 32.2% stake in Craft Brew Alliance, which owns a number of craft beer brands, including Kona, Redhook, and Widmer Brothers. Constellation Brands, meanwhile, has acquired craft beer brands like Ballast Point and Funky Buddha, taking over Ballast Point in 2015 for $1 billion and Funky Buddha for an undisclosed amount. There are signs the company overpaid for those acquisitions, though, as it was forced to write down $86 million in the goodwill value off the Ballast Point buyout. It's not just one or two companies snapping up smaller brewers, either. In 2017, Heineken took full control of Lagunitas for an undisclosed amount, and Sapporo bought Anchor Steam, often called the original craft brewer, for $85 million. This consolidation bears a close resemblance to what's happened in the soft-drink industry as Coca-Cola and PepsiCo have swallowed up smaller, alternative beverage brands. In recent years, Coke has acquired brands like Zico coconut water, Honest Tea, and VitaminWater as soda sales declined amid health concerns. In the internet age, smaller brands across the consumer packaged goods industry have a new edge over larger traditional brands, and the backlash against sodas and macrobrews seems to come in part from consumers' desire for unique, authentic brands that suit their tastes. While craft beer is still growing, the overall beer is losing market share to other types of alcohol like wine and liquor, as whiskey, in particular, has become more popular. From 2000 to 2016, the market share of spirits grew from 28.7% to 35.9%, while beer has fallen from 55.5% to 47%. It's clear that macrobrew drinkers have been switching to craft beers, but consumers who were drinking beers like Sam Adams and Sierra Nevada a few years ago may be moving on to liquors, or younger drinkers may simply prefer whiskey over beer. In addition, the low-carb diet trend has been a headwind for beer and may be motivating some drinkers to switch to liquor or wine. Sales for American whiskey, which includes bourbon, were up 6.8% last year to $3.1 billion. Let's take a look at a few of the highest-profile craft beer stocks. As one of the only pure-play craft brew stocks and a company that defines itself by craft beer, Craft Brew Alliance may be the first place interested investors will want to look. The stock has performed well over the last five years, gaining 153% in that time, but its record has been volatile as the chart below shows. CBA was formed in 2008 in a merger between Redhook and Widmer Brothers, and the company added breweries including Kona, Appalachian Mountain, Omission, Cisco, Square Mile Cider, and Wynwood over the years. Today, Kona is by far its biggest brand, making up more than half of its barrels sold. Craft Brew Alliance calls itself the sixth-largest craft brewing company in the U.S., and benefits from a strategic partnership with Anheuser-Busch, which now owns 31.4% of CBA and whose wholesale network buys nearly 90% of CBA's beer. Revenue growth at CBA has been flat in recent years. Between 2014 and 2017, total revenue increased just 3.7%, a sign that the company was losing market share in craft beer as the number of brewers continued grow and bigger companies made acquisitions in the space. Looking ahead, Craft Brew Alliance plans to deliver growth by expanding its portfolio of flavors under the Kona brand, improving cost structure to widen its gross margin, and leveraging its partnership with Anheuser-Busch. Among the efficiencies the company is focused on are producing and shipping beer from Anheuser-Busch's Fort Collins brewery, taking advantage of Anheuser-Busch's international distribution network to expand the availability of brands like Kona. The possibility of Anheuser-Busch making a full-on acquisition of CBA also looms. After its first-quarter earnings report out on May 9, the company said it expected depletions, a key industry metric that represents sales from the distributor to the retailer and is seen as a proxy for consumer demand, and shipments (sales from the brewer to the distributor) to be essentially flat for the year and gross margin of 32%-35%, up from 31.5% a year ago. Craft Brew Alliance trades at a P/E ratio of 50 based on this year's expected earnings, even though sales growth is predicted to be slow. Analysts are expecting profit growth, however, due in part to the company's cost-cutting initiatives and other plans to boost efficiency. 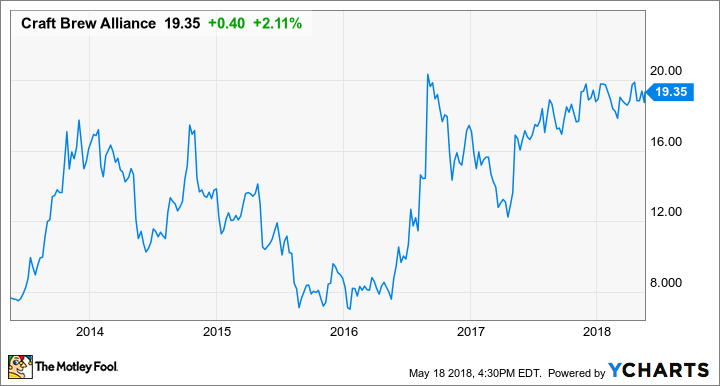 After falling on tough times in recent years, Boston Beer has actually bounced back, and its stock has climbed 73% over the last year, while sales surged 17% in the most recent quarter, restoring investor confidence in the company. In addition to Sam Adams, the company's flagship brand, Boston Beer owns Twisted Tea flavored malt beverages, Angry Orchard hard ciders, and other beer brands including Coney Island, Concrete Beach, Angel City, and Traveler. The company is one of the largest craft brewers in the U.S. with 3.8 million barrels sold last year, and focuses on the Better Beer segment, which is composed of craft beers, domestic specialty brews, and most imports. The category generally has a higher price and better quality, taste, and image than beers from industry giants like Anheuser-Busch and Miller Coors, which control 80% of the domestic market. Craft beer drinkers are likely to favor Better Beers in general, as opposed to fans of domestic macrobrews, which are significantly different in quality and taste. Boston Beer estimates that the Better Beer makes up 22% of beer sold in the U.S. The company aims to be a leader of the category, and considers the quality of its beverages its key strength. From 2015 to 2017, revenue fell by nearly 10% as consumer tastes seemed to shift away from Sam Adams to microbrews and liquors such as whiskey. In the first quarter of this year, sales began to grow thanks to new products like Sam '76, Sam Adams New England IPA, and Angry Orchard Rose. Depletions increased 8% in the quarter and gross margin improved 330 basis points to 50.5%. Chairman Jim Koch said it was too early to say if those new products would continue to fuel growth or to "draw conclusions on their long-term impact." Production innovations also helped drive a 15% jump in shipment volumes to 813,000. Boston Beer doesn't break out sales according to beverage type, but beer makes up the vast majority of sales, and will continue to bear the responsibility for the performance of the business. For the full year, management sees depletions and shipments between flat and up 6%, gross margin of 52%-54%, and adjusted earnings per share of $6.30-$7.30, up from adjusted earnings per share of $6.00. After the recent surge, Boston Beer looks pricey at a P/E of 36 based on this year's expected earnings per share, as it doesn't seem to have the same opportunities to improve operating leverage that CBA does. Still, if the new flavors take off, the stock could keep moving higher. Constellation Brands, the U.S. distributor of the Modelo Group brands, which include Corona, has been the unquestionable winner among beer stocks in recent years. Over the past five years, Constellation Brands shares have jumped more than 300% as the company's strategy to ramp up marketing and distribution of the Modelo brands has paid off handsomely, and it has also benefited from an increase in consumption of imported beers, especially Mexican ones. According to Brewers Association, volume sales of imports grew 3.2% last year to 34.4 million barrels, compared to 5% growth in craft beer to 24.9 million barrels. Mexican beers now make up more than two-thirds of imports as the growing Hispanic population, the style's easy drinkability, and successful marketing campaign brands like Corona's have driven steady growth. But Constellation's move into craft beer has been less starstruck, as it was forced to write down $86 million of its $1 billion 2015 acquisition of Ballast Point, and some have questioned its recent takeover of Funky Buddha Brewing, even though the amount was not disclosed, as it makes the company more vulnerable to the backlash against craft beers that have "sold out." . Its recent performance remains strong, though, as adjusted earnings per share increased 29% in fiscal 2018, and it saw depletions increase 9.8%, paced by the Modelo brand family, where depletions jumped 18%. Constellation doesn't report separate numbers from its craft beer brands as they make up just a fraction of the overall beer business. However, the company did say that depletions and sales trends for Ballast Point turned negative in the first quarter of 2018, and its decision to write down $86 million in volume due to "certain negative trends within its craft beer portfolio" is a sign that its performance has been disappointing as it seems to be plagued by similar challenges to Sam Adams and other regional brewers. For the current year, Constellation expects more modest earnings-per-share growth of about 10% as its Mexican beer business matures, but it still sees net sales for beer increasing 9%-11% for the year, much better than the broader industry. It's been rearranging other parts of its portfolio as its pivots to premium brands. It sold its Canadian wine business, and acquired High West Distillery, a maker of high-end whiskeys, as well as Charles Smith Wines. Constellation also made the bold move of investing in a Canadian marijuana company, Canopy Growth, taking a 10% stake in the company and forming a strategic alliance. The move could lead to Constellation developing cannabis-based beverages if marijuana becomes legal in the U.S, and gives the company a significant foothold in a growing market. With its portfolio strategy demonstrating a track record of success and a modest P/E of 25, Constellation could have more strong growth ahead of it. Time to raise a glass? As the examples above show, investing in the craft beer industry may not seem as easy as it sounds. Sales of craft beer itself are slowing and there are few options for investors looking for a pure play in the industry, and both Craft Brew Alliance and Boston Beer have slumped in recent years, though at least the latter looks like it's on the mend. Meanwhile, Anheuser-Busch and other global giants are swallowing up smaller brands that could have presented opportunity for investors if they were to go public. As you can see, analysts are expecting exceptional growth from Craft Brew Alliance over the next two years, but that already may be factored into its share price. Meanwhile, Boston Beer's earnings are also expected to recover after sliding recently, though that stock is also pricey compared to an S&P 500 average P/E ratio around 25. Growth expectations for Constellation are more modest, but the stock is cheaper based on earnings. Of the three, Constellation appears to be the least risky, not just because its price is lower, but because its diversification across wine, liquor, and now marijuana helps protect it from the growth of microbrews that have hammered Boston Beer and Craft Brew Alliance in the past. Investors looking for a true craft-beer investment would want to choose between CBA or Boston Beer as CBA is the purest representation of the industry. However, Constellation's recent growth, its price, and its diversification make it a better all-around bet, and give investors some exposure to craft beers through its Ballast Point and Funky Buddha acquisitions. Considering the company's penchant for deal-making, I wouldn't be surprised to see it bring more craft beer brands on board in the future.